This article examines the genesis and traces the development of Hizbut Tahrir in Indonesia (HTI). It argues that HTI’s longevity and its appeal among Indonesian Muslims has been largely attributable to the organization’s ability to transmit a message that does not directly challenge the state’s ideology of Pancasila, though its agenda remains firmly anchored in a commitment to establish a sharia law-based caliphate. However, President Joko Widodo’s decision in July of last year to amend the Community Organization Law and to thereby mandate the revocation of HTI’s legal status, appears to have marked a turning point in the organization’s relationship with the state. The law’s amendment and subsequent revocation order — one of several recent measures aimed at countering extremism raises questions not only about the future of the organization but of the Indonesian government's ability to uphold freedom and preserve religious tolerance. Hizbut Tahrir (HT), meaning “Party of Liberation,” is an international Islamist movement with chapters in more than 40 countries. Established as a political party in Jerusalem in 1953 by Sheikh Taqi al-Din An-Nabhani, and Islamic scholar, HT’s stated objectives are to revive the Muslim world from its perceived decline, liberate Muslims from the thoughts and systems of unbelievers, and restore the Islamic Caliphate. Al-Nabhani himself was a sharia educator and later a judge, initially serving in the Sharia Court of Ramallah and subsequently in Jerusalem. Having lived through the 1948 Arab-Israeli conflict, Al-Nabhani believed that liberating Palestine was intertwined with reviving Islam as a political identity through the restoration of the Islamic caliphate and its institutions and functions in the region. Therefore, al-Nabhani did not conceive HT as an organization with a global reach; rather, he focused on building a strong presence of HT in Arab countries, including Iraq, Syria, Lebanon, Jordan and Egypt. During the 1960s and 1970s, HT sought to assume power through conducting coup attempts in Jordan (1968), Syria (1969) and Egypt (1974). These coup attempts showed HT’s penchant for building partnership with elements within the armed forces. It was not until 1977 — as the repression against the HT gained momentum and the organization’s leadership passed on to Sheikh Abdul Qaleem Zalloum — that HT members emigrated to Australia, the United Kingdom and the United States, and following the Cold War, to Central Asia, the Caucasus and Southeast Asia. HT in Indonesia (Hizbut Tahrir Indonesia/ HTI) did not make its public and formal appearence until after the inception in 1998 of Indonesia’s democratization process, during which a number of local as well as transnational Islamist organizations calling for the establishment of a sharia-based state under the caliphate have emerged on the scene. Formerly an underground campus movement in the early 1980s, HTI is unique among the Islamist organizations that have mushroomed in post-authoritarian Indonesia. HTI has derived its ideology entirely from Middle Eastern sources. It has generally refrained from the use of force and the commission of terrorist acts, unlike organizations such as the Council of Indonesian Mujahidin (Majelis Mujahidin Indonesia/ MMI) and the Islamic Defense Front (Front Pembela Islam/ FPI). And, until very recently, it has enjoyed a greater freedom to organize and operate than in other countries that host Hizbut Tahrir chapters. For more than two decades — until the government revoked its permit in July 2017 — HT enjoyed a freedom to conduct its propaganda and mass mobilization in Indonesia. States that are more Islamic and authoritarian than Indonesia have banned the organization. The Jordanian government refused to recognize HT as a legally-sanctioned organization; Bangladesh accused HT of committing violence and terrorist activity; and Tunisian authorities rounded up HT youths for criticizing government’s policies. Turkey wasted no time in crushing the organization. Pakistan, too, arrested HT members on suspicion of plotting terrorist acts. Meanwhile in Indonesia, in spite of having had its status as a legal entity revoked, HTI leaders appeared in news media, together with their lawyer Yusril Ihza Mahendra, former Minister of Law and Human Rights, lodging a constitutional court challenge against the presidential decree that has sought to shut down the organization. The appeal of HT’s ideology to Indonesian Muslims lies in its emphasis on the urgency to engage the Muslim community to internalize Islamic ways of life, as opposed to focusing solely on Islamizing the state. The appeal of HT’s ideology to Indonesian Muslims lies in its emphasis on the urgency to engage the Muslim community to internalize Islamic ways of life, as opposed to focusing solely on Islamizing the state. By way of slightly revisiting An-Nabhani’s thinking, the revival of the caliphate takes three stages that emulate the method of action of the Prophet Muhammad in taking over the leadership in Madinah: 1) formation of a vanguard of strong believers to propagate the idea of a world that facilitates total application of sharia (also known as tatsqif); 2) socializing the Muslim community with a totality in the application of Islam in affairs of their lives; and 3) establishing a government to implement Islam comprehensively and propagate Islam further to the world. HT’s emphasis on engaging the ummah through discussions about what can and cannot be justified as being “Islamic” dovetailed with the aims of Indonesian Islamists in the 1980s, who sought to institutionalize sharia. In fact, long before the entry of HT into Indonesia, an array of Islamic movements — seeking to attain national leadership, whether through legitimate non-violent political means or through armed insurgency and terrorism — had sprouted. President Suharto’s regime, which formally assumed power in 1967, effectively silenced the power of political Islam by instituting state policies aimed at de-ideologizing politics in furtherance of national development. By the time of HT’s entry into Indonesia in the early 1980s, the leaders of the country’s various Islamic movements had chosen to focus on the non-political path of Islamic learning in the form of Qur’an recitation and discussions, mostly among university students. In order to escape repression, they eschewed public expression of political identity; and in order to cultivate the feeling unity of the ummah against repression, the movement’s conducted their activities clandestinely. Similarly, HT’s entry into Indonesia was initiated by underground campus-based discussions. A cross-border network of individuals facilitated HT’s entry into Indonesia, notably, Abdullah Bin Nuh, an Indonesian pesantren (Islamic boarding school) owner, and Abdurrahman Al-Baghdadi, an HT member and Muslim émigré in Australia. Visiting his son who was studying in Australia, Abdullah Bin Nuh contacted HT members who had emigrated from the Middle East. Impressed by HT’s ideology and method of action, Nuh invited Al-Baghdadi to teach in his pesantren in Bogor, West Java. Al-Baghdadi subsequently delivered sermons in a mosque at Bogor Agricultural Institute (Institute Pertanian Bogor/ IPB). It was from this mosque that Al-Baghdadi’s convened a study circle of students that laid the basis for the establishment of HTI. From the IPB mosque, Baghdadi’s study circle expanded to several mosques in the surrounding area, and later to the cities of Bandung (West Java), Surabaya (East Java) and Makassar (South Sulawesi). HTI increased its membership through informal networks of family, friends and co-workers; and even organized youth training programs and outings. At all of its events and activities, HTI collected funds through zakat and donations. During the 1990s, the Indonesian political context changed. In the face of a burgeoning middle class demanding greater openness, President Suharto relaxed restrictions on Islamic groups. Importantly, he permitted HTI members and supporters to participate in the newly created Indonesian Muslim Intellectuals Association (Ikatan Cendikiawan Muslim Indonesia/ICMI). During this same period, HT Indonesia established As-Salam Wakaf Association to manage their funds, and began publication of the Al-Islam Bulletin (Buletin Al-Islam). The space created by Suharto’s easing of restrictions on Islamic groups allowed HTI to build a strong base and even assist HT chapters in Malaysia and Singapore. The name Hizbut Tahrir in Indonesia did not publicly appear until 2000 when the Al-Islam Bulletin identified by name Syabab Hizbut Tahrir Indonesia as its publisher. From then on, HTI’s public presence increased, through gatherings that involved hundreds of members and sympathizers, such as the Al-Khilafah Al-Islamiyah conference in 2000. 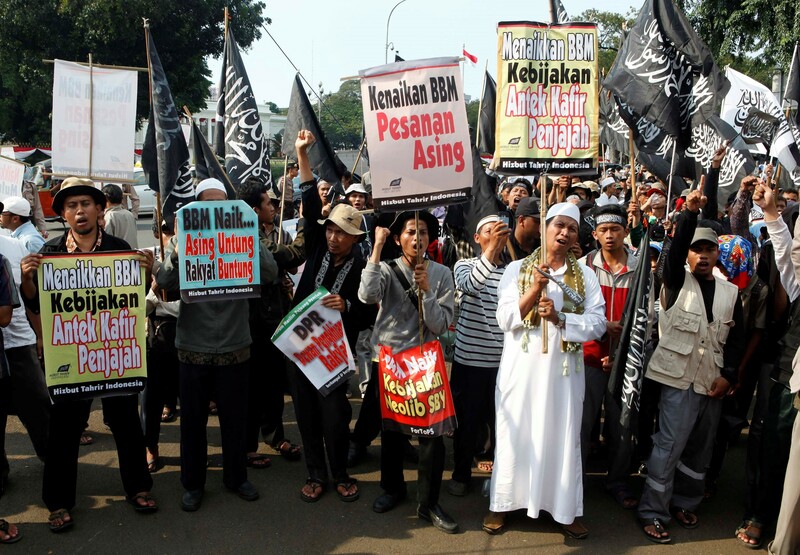 HTI conducted frequent street marches in major cities in Indonesia either to protest government policies or to commemorate the anniversary of the abolition of the caliphate. By the early 2000s, the organization appeared to have grown confident of public support for the idea of a caliphate, and like other mass organizations in the aftermath of Suharto’s resignation from the presidency, exploited the freedom of expression that came with democratization. In the post-Suharto era, HTI implemented the “politics of presence” by putting forward its arguments on current political issues. In the post-Suharto era, HTI implemented the “politics of presence” by putting forward its arguments on current political issues. Through its publications, HTI argued that democracy had been a costly experiment for Indonesia that had produced contradictions and corrupt elected officials. HTI publications also reported that public support for the introduction of sharia in Indonesia increased to 67 percent while disapproval of the House of Representatives rose to 84 percent, and the share of eligible voters who had not cast ballots in district elections ranged between 35 to 46 percent. HTI also responded to issues that resonated with Indonesian Muslims. Throughout 2004 and 2005, HTI held frequent marches to express their views in the lead-up to general elections (for legislative members and the president) and the commemoration of the abolition of the Ottoman Caliphate. Interestingly, on both occasions, HTI did not voice their antagonism towards the nation-state system. In the case of presidential election, HTI spokesperson Ismail Yusanto argued that HTI would not direct its members and sympathizers to select a particular candidate but rather urge them to carefully select a candidate, ideally a male, who was willing to implement sharia. In the case of the commemoration of the abolition of the Ottoman Caliphate, HTI’s campaigners urged the masses to both implement and enforce sharia in their daily lives and the government to put an end to secularism and corruption. Thus, HTI did not strike at the integrity of the nation-state system, but rather urged the strengthening of the state to enforce the laws of Islam. In the domestic political arena, HTI has supported positions taken by Islamist-nationalist elements. Such was the case when HTI endorsed a fatwa issued by Indonesian Ulama Council (Majelis Ulama Indonesia/MUI) — a state-sanctioned organization for Muslim scholars where some of the HTI members also sit — declaring that secularism, liberalism and pluralism violate Islamic teachings. During Jakarta’s gubernatorial election in 2017, HTI positioned itself more firmly with the Islamist-nationalist wing — instead of renouncing elections altogether — by announcing its rejection of one of the candidates based on their view that Muslims should not vote for a non-Muslim to be a leader. HTI maintains a nation-wide operational presence in Indonesia, including provinces that are far from the capital city Jakarta, such as Aceh and South Sulawesi, where the central government’s control is relatively weak. Although HTI’s structure and the size of its membership have never been made public, the organization has shown the ability to draw large numbers of people to its public gatherings. HTI’s ability to mobilize these large crowds reflects its responsiveness to various issues that have touched people’s daily lives. HTI’s ability to mobilize these large crowds reflects its responsiveness to various issues that have touched people’s daily lives, including increases in national electricity tariffs, water resources regulation in West Java, early learning centers for toddlers in Central Java, as well as international events such as terrorist attacks and government repression in Uzbekistan, and the publication of the Prophet Muhammad cartoon in Denmark. ➢ Adhyaksa Dault, former Minister of Youths and Sports, current Chairman of Indonesian Scouts Movement and member of the Prosperity and Justice Party (Partai Keadilan dan Sejahtera/PKS). ➢ Amien Rais, former chairman of the People’s Consultative Assembly and National Mandate Party (Partai Amanat Nasional/ PAN). ➢ Fadilah Supari, former Minister of Health; Tyasno Sudarto, retired General and former Army Chief of Staff. ➢ Bima Arya Sugiharto, the current Mayor of Bogor. The relationships that HTI has cultivated with these and other notables has bought the organization freedom from government persecution. However, as recent events have shown, the HTI has not succeeded in completely shielding itself. Against the backdrop of rising sectarian tensions and a series of massive rallies of which HTI was one of the principal organizers, President Joko Widodo issued last July a presidential decree decree permitting authorities to disband organizations deemed threatening to national unity. Several days later, the Law and Human Rights Ministry revoked HTI’s status as a legal entity on the grounds that the latter’s activities contravened Pancasila, the state ideology. The immediate effect of the revocation is to deprive HTI of institutional-legal protection, which would expose its members to screening and possible sanctions by employers seeking to curb or prevent their workers’ affiliation with the organization. However, the revocation has not shuttered HTI altogether or led to the arrest and detainment of its members. The banning of HTI proved controversial, even within the government itself. It is also important to note that HTI has turned to the legal process, rather than to violence, in an effort to contest the revocation order. The prospect of a lengthy legal battle poses one challenge for the government as it seeks to rein in HTI. The fact that HTI is a well-established entity with wide influence and seemingly ample financial resources is another. Moreover, even were the authorities to succeed in substantially curtailing HTI’s activities within the country, dissolving the organization would seem unlikely, given that its tentacles extend to Australia, Malaysia, and Singapore. The continuing existence of Hizbut Tahrir in Indonesia, and by implication the states in the region, can be explained by three factors. First, the pace of globalization since 1970s allowed HT members — persecuted in various Arab states due to their aggressive attempts to assume power — to emigrate to Western countries and then Muslim-populated nations in Africa, Central Asia, Caucasus and Southeast Asia, thereby expanding its network and allowing it to internationalize. Secondly, the approach that HT has employed in Indonesia meshes with the spirit of the broader Islamic political movement in the country, which has been seeking to Islamize politics and society. Moreover, HTI has proven itself capable of modifying its movement to fit the changing context of Indonesian politics: secretive and low profile during the authoritarian era, and capable of mass mobilization during the democratic era. Finally, HTI has demonstrated that it is capable of penetrating circles of civilian and military leaders and acquiring the protection they need in return for their capacity to mobilize sympathizers for the cause of Islamist-nationalist interests. HTI needs this protection not only to avoid a government crackdown but also because the organization remains on the margin of Indonesian political Islam in terms of its ideological orientation and limited political leverage. President Joko Widodo’s decision to revoke HTI’s permit dealt a significant blow to the organization’s capability to organize. Nevertheless, HT’s chapter in Indonesia has established its roots deeply within Indonesian society, and has widened its presence regionally. HTI did not rely upon particular leadership figures to sustain the movement. In fact, the identities of very few of its top decision-makers of HTI have been made public, and their engines of mobilization are at the grassroots level. Thus, in order to counter HTI effectively, Indonesia must further empower and legitimize its institutions of democracy, including political parties, the parliament and the judiciary. Without competent and incorruptible stewardship of the republic, alternative ideologies and systems such as the sharia-based caliphate offered by Hizbut Tahrir will retain its appeal. B. Muhtadi, “The Quest for Hizbut Tahrir in Indonesia,” Asian Journal of Social Science 37, 4 (2009): 623–645. M. A. Nasir, “The ʿUlamāʾ, Fatāwā and Challenges to Democracy in Contemporary Indonesia,” Islam and Christian-Muslim Relations 25, 4 (2014): 489–505. K. De Jong, “The Radicalisation of Religions during the Reformation Period,” Studies in Interreligious Dialogue, vol. 22, no. 1, 2012, 99–122. See for example, Safrin La Batu and Nurul Fitri Ramadhani, “Indonesia disbands Islamic group Hizbut Tahrir,” The Jakarta Post, July 19, 2017, accessed January 1, 2018, http://www.thejakartapost.com/news/2017/07/19/govt-disbands-hti.html. “HTI Asked for Delay of Minister’s Decision’s Implementation,” KOMPAS, November 23, 2017. M. N. Mohamed Osman, “Reviving the Caliphate in the Nusantara: Hizbut Tahrir Indonesia’s Mobilization Strategy and Its Impact in Indonesia,” Terrorism and Political Violence 22, 4 (2010): 601–622. C. Formichi, Islam and the Making of the Nation: Kartosuwiryo and political Islam in twentieth century Indonesia (Leiden: KITLV Press, 2012). D. A. Phillips, Indonesia (Philadelphia, PA: Chelsea House, 2005). R. W. Hefner, Civil Islam: Muslims and Democratization in Indonesia (Princeton, NJ: Princeton University Press, 2000). As the study circles proliferated, they were organized into the Institute for Campus Proselytization (Lembaga Dakwah Kampus/LDK), which, in 1986, held a Reunion of LDK Members (Forum Silaturrahmi Lembaga Dakwah Kampus/FSLDK) — the forerunner of HTI. Student-members of HT who graduated continued their activism through the Islamic Study Group Standard Chartered (Kelompok Studi Islam Standard Chartered/ KSISC), meeting regularly at the Standard Chartered building in Jakarta. For further details, see M. N. Mohamed Osman, “Reviving the Caliphate in the Nusantara : Hizbut Tahrir Indonesia’s Mobilization Strategy and Its Impact in Indonesia,” Terrorism and Political Violence 22, 4 (2010): 601–622. The regime, however, remained sensitive to public criticism. For example, an opinion piece by an HTI member that criticized the Central Bank caused the name of the Al-Islam Bulletin to be changed to As-Salam. M. I. Ahnaf, “Between Revolution and Reform: The Future of Hizbut Tahrir Indonesia,” Dynamics of Asymetric Conflict 2, 2 (2009): 65–85. K. Ward, “Non-violent extremists? Hizbut Tahrir Indonesia,” Australian Journal of International Affairs 63, 2 (2009): 149–164. V. R. Hadiz, “A New Islamic Populism and the Contradictions of Development,” Journal of Contemporary Asia 44, 1 (2013): 125–143. C. Harb and R. Fischer, “Terrorism and jihad in Indonesia: Questions and possible ways forward,” Asian Journal Social Psychology 16, 2 (2013): 117–122. M. Hatherell and A. Welsh, “Rebel with a Cause: Ahok and Charismatic Leadership in Indonesia,” Asian Studies Review 41, 2 (2017): 173–189. HTI mobilized protesters in various public issues as reported in “Pre-School Education By HTI,” KOMPAS, Jogja Edition, June 25, 2005; KOMPAS, West Java Edition, “Water Resources Law Challenged By HTI,” June 10, 2005; “Hizbut Tahrir Mobilized People in Yogyakarta for Bloodshed in Andizhan,” KOMPAS, May 21, 2005; “Hizbut Tahrir Refused Foreign Interventions in Papua and Aceh,” KOMPAS, August 15, 2005; “Hizbut Tahrir Refused Abortion Legalization,” KOMPAS, West Java edition, September 20, 2005; “Terrorism Handling: Suicide Bombing is not Jihad,” KOMPAS, December 5, 2005; “Hizbut Tahrir Sukabumi Proposed Corruptors’ Wealth Confiscation,” KOMPAS, October 3, 2005; “Hizbut Tahrir Mobilized Protest Against Muhammad Caricature,” KOMPAS, East Java edition, February 9, 2006; “HTI Mobilized Mob to Protest Muhammad Caricature,” KOMPAS, West Java Edition, March 6, 2006; Hizbut Tahrir: Beware of Religious Syncretism, KOMPAS, January 2, 2008; and “HTI Refuses Governor Basuki’s Leadership,” KOMPAS, September 5, 2016. M. N. M. Osman, “The transnational network of Hizbut Tahrir Indonesia,” South East Asia Research 18, 4 (2010): 735–755. Can opposition firebrand turn the tide in Turkey?